The other day, Ashley, Natalie, Remy, and I all took our first trip into a LUSH store. As I’m sure you’ve noticed, I’ve gotten quite attached to the company; they make products in awesome ways without harming animals at all, and it’s all just so damn great. 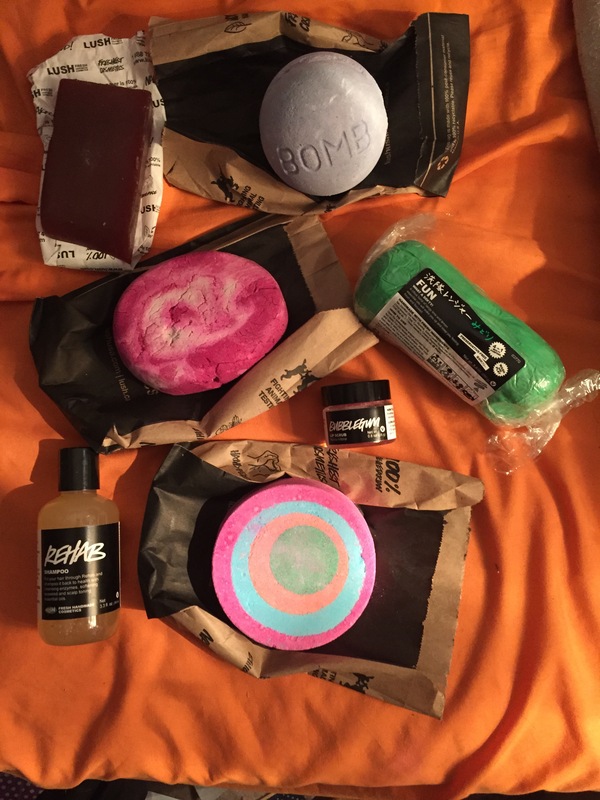 Sadly, my area didn’t have a LUSH shop until about a month ago. It’s an hour from where I live, but was well worth the drive for the lovely items I got. I spent around $100 on these, and I think that’s a pretty fair price for the amount I got. I went into LUSH knowing I wanted to at least smell this bath bomb. I’ve seen it online but wasn’t sure if I’d like the way it smells enough to buy it. Turns out I do. I am in love with my red FUN; it has been lasting me forever, can be used for anything, and smells fantastic. The green smells a bit like Sprite in the best way possible. I kid you not, Fangirls, this smells like candy heaven. Also, it’s ginormous, so I’m sure I’ll be able to use it for multiple baths. Heck. Yeah. I’ve never tried a LUSH shampoo, and the idea of solid shampoo kind of freaks me out, so I went with a liquid. It’s a rather expensive bottle, but I’m hopeful that it’ll work the wonders it professes to. I have a sample of this soap that I got in one of my shipments, and instantly fell involve with the scent. I couldn’t wait to get to the store and grab a bigger hunk of it. This bath bomb is one of my favorites to watch videos of, because it’s so dang pretty. I can’t wait to take a bath in this magical creation. I haven’t used this much yet, but when I did, it made my lips feel amazing. They felt so dang soft, plus you get to eat the scrub off of your lips, and it tastes just like bubblegum! 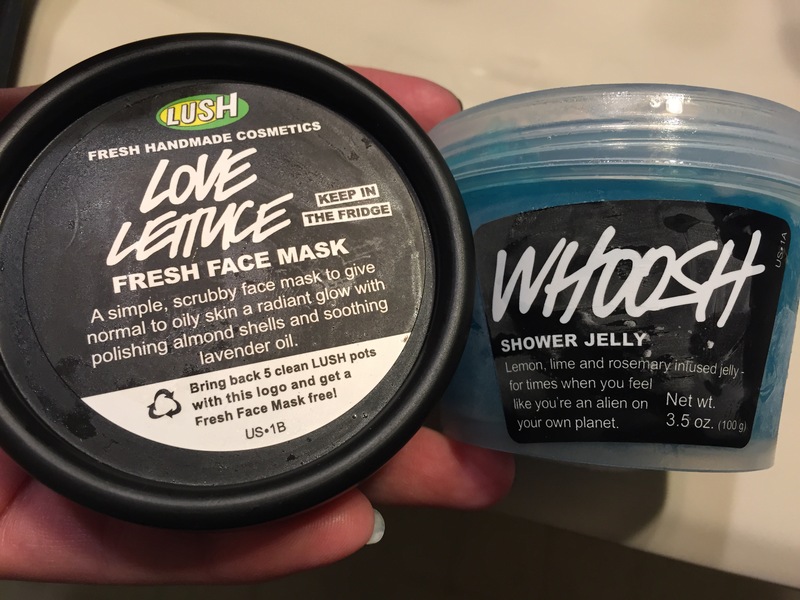 This was recommended to me both by the LUSH twitter, and the girl working at the store. It’s not something that can be shipped, because it’s fresh and can be damaged in the heat. Another item it was suggested that I try is a shower jelly. These are little cups of what looks like jello that you break a little piece off of, and lather up your bod with. This one smells like the beach, and I’m really excited to get to rubbing. So that’s it for my first trip to a LUSH store! The video is super awkward, but you should go laugh at how goofy I am. I’ve been using one of the solid shampoos, Jumping Juniper. It’s amazing. And it doesn’t even look used even though I’ve been using it every day for a couple weeks now. My hair feels so good when I use it. I’m going back to the store tomorrow and I’m sure I’ll get a great haul. That’s awesome! I’m super intimidated by their solid products, I’m glad they’re recommendable!